Read The Martlet article below or on their website. When Julie and Colin Angus arrived in Costa Rica after 10 000 km and five months at sea, Julie became the first woman to cross the Atlantic in a rowboat. According to them, Colin became the hairiest man to do the same. Julie and Colin Angus are adventurers, best-selling authors, and riveting keynote speakers. Their adventures have seen them travel from Scotland to Syria by bicycle and rowboat, sail the Mediterranean to trace the origin of the olive tree (with a 10-month-old in tow), and go from Portugal to Costa Rica in a rowboat. “Yeah, we really like boats,” joked Colin. 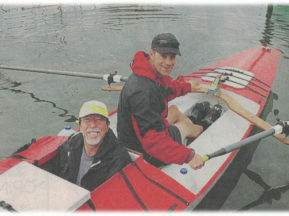 On Oct. 26, the duo spoke about their 2006 human-powered trip at the Maritime Museum as part of the Nautical Nights Speaker series. They kept the audience at the edge of their seats, describing the rush of having two weeks to prepare a rowboat for five months on the water — the bittersweetness of sailing away from shore, and the feeling of being crammed in the cabin of a rowboat for three days in a hurricane. 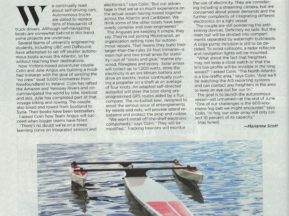 They also spoke of their current project: they want to build the world’s first autonomous boat that will successfully cross the Atlantic, unmanned. The boat is set to launch in summer 2018 from L’anse aux Meadows, NL, where it will cross the ocean to the shores of Ireland. “It’s something we thought about while we were rowing across the Atlantic because we were there for so long, every day, watching the ocean,” said Julie. 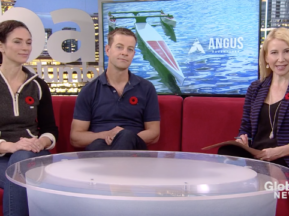 Julie and Colin have teamed up with UVic’s Engineering department to create the boat, which will be live tracked on the Weather Network website. 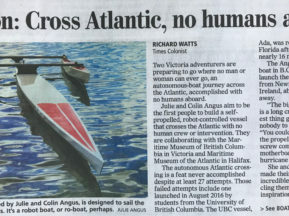 Twenty-seven autonomous rowboats have attempted to cross the Atlantic, but all have failed due to technical malfunctions, sharks and foul weather. “Somebody’s going to do it one day, so we’d like to have a shot at it,” said Julie. Julie completed a Masters in molecular biology here at UVic, and a undergraduate degree in biology and psychology at McMaster University. She says that her science background has helped shape her adventures. 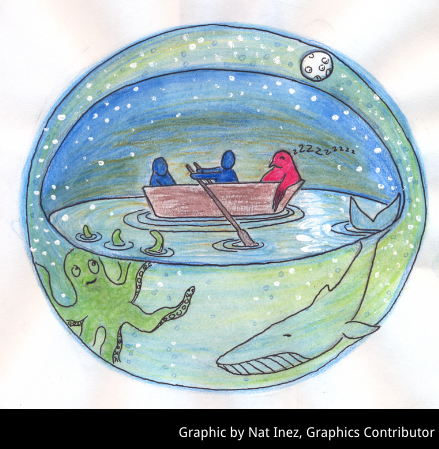 Nautical Nights is a series of presentations at the Maritime Museum on the last Thursday of each month. Tickets to their next event can be found on the Maritime Museum website at www.mmbc.bc.ca/tag/nautical-nights/.